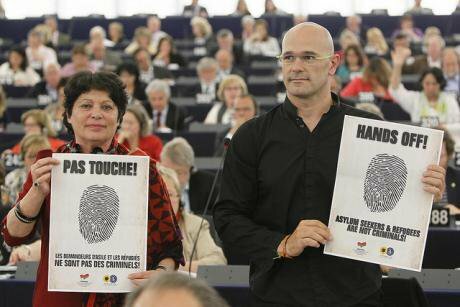 Following the passage of controversial proposals on the EURODAC database of asylum applicants' and refugees' fingerprints,Greens/EFA MEPs protest the erosion of asylum seekers' basic rights, 2013. wikicommons/Greensafe. Some rights reserved.The practice of making and granting claims of asylum based on persecution is one of the most concrete expressions of human rights. Yet after more than sixty years, the refugee regime is facing an existential threat. While Donald Trump’s latest executive order has delivered the greatest blow, European states have weakened the regime by refusing to receive and resettle refugees and through their use of discriminatory policies of selection. Regrettably even liberal minded voices are undermining the human rights architecture upon which the refugee regime is based. The 1951 Refugee Convention does not define persecution. It is a curious but historical fact that neither Article 1, which introduces the definition of a refugee, nor the term ‘persecution’ feature much in the initial analysis of the Travaux Préparatoires which detail the discussions that gave way to the Refugee Convention. Rather, Paul Weis’s celebrated analysis begins with Article 2 on the general obligations of refugees. In spite of this omission, legal scholars have held that persecution connotes ‘injurious’ or ‘oppressive action’ which is informed by human rights standards in the country from which the asylum seeker has fled. It is specifically this linkage to human rights which underpins the way claims are evaluated and which is crucial for the preservation of asylum. That is why the decision by Greece’s Supreme Court this week regarding the claims of eight Turkish officers accused of involvement in the failed Turkish coup is so very important. Rather than bow to political pressure, for fear of upsetting a neighbouring NATO member state, the Court ruled that the defendants faced human rights violations if the request for extradition to Turkey was upheld. The Court’s decision unequivocally affirmed the right to seek and receive political asylum. That is why the decision by Greece’s Supreme Court this week regarding the claims of eight Turkish officers accused of involvement in the failed Turkish coup is so very important. By contrast, Trump’s draft executive order blatantly illustrates how geopolitical concerns may interfere with the protection of refugee rights. The draft, entitled, “Protecting the Nation From Terrorist Attacks by Foreign Nationals’, introduces a temporary ban on particular nationalities who are excluded from the US resettlement programme. This applies to refugees from Syria, Iraq, Iran, Libya, Somalia, Sudan and Yemen. The draft order caps refugee admissions at just 50,000 and also bars nationals from those states, even those holding visas, from entering the USA. It is not just that refugees from Syria, Iraq and Somalia make up more than half the world’s refugee population, the order is fundamentally discriminatory even against those fleeing IS, Al-Shabab, and other oppressive regimes. Refugee support organisations based in the USA have already noted that in the absence of the US resettlement scheme, more refugees from those states will be pressed to take their chances crossing the Mediterranean to reach Europe. Yet, here too, European states have also cherry picked among those they wish to consider for refugee status. This is most clearly evidenced in Greece, a country which is now holding tens of thousands of people who have been denied the right to relocation offered only to nationals who have an average EU-wide asylum recognition rate equal to or higher than 75 per cent. The scheme covers Syrians, Iraqis and Eritreans but leaves out Afghans, Iranians, and Pakistanis. What is more, the scheme only covers those in Greece before 20 March 2016 when the EU-Turkey deal came into effect. While Greece will be left to process claims for tens of thousands of non-privileged asylum-seekers, the emerging consensus is that by restricting the flow of refugees to developed states by offering incentives to lesser developed states to house them, refugees will be able to find protection elsewhere – increasingly in oppressive states like Turkey and Ethiopia. The fact that large groups of refugees are geographically contained has given rise to further security and development initiatives, most notably the expansion of mobility partnerships and common agendas. Although these arrangements differ from one state to another, and while full mobility partnerships offer some visa facilitation to generally highly skilled nationals on the premise of signed readmission agreements, they have no basis in EU law. The overarching focus is cooperation on matters of security and irregular migration in return for aid. In effect, these programmes deny refugees the right to freedom of movement and in so doing also close off safe and legal routes to seek asylum. The EU-Turkey deal is perhaps the most egregious example of a mobility style partnership where, in exchange for blocking the flow of refugees to Europe, Turkey has received billions of euros in aid and Erdogan’s abuses have been tolerated. While most refugees have been unaffected by the post-coup clampdown, more than 800 people have been returned from the EU to Turkey, some sent to inhospitable detention centres, as reported by Human Rights Watch. Similarly, the partnership with Ethiopia has been welcomed even though it may be perceived as a fig leaf to a regime which has killed more than 500 peaceful protestors and is not stemming the flow of irregular migrants to the southern Mediterranean. With large numbers of refugees contained in the Global South and Middle East, some scholars and development experts have militated for a new paradigm based on the creation of special economic zones. Most notably, Oxford University Professors Paul Collier and Alexander Betts have proposed that through such zones, jobs can be brought to refugees. Yet, these can only function on the basis that mobility rights are effectively curtailed. The focus is pragmatic and overwhelmingly centres on livelihoods, not access to civil and eventually to political rights which is effected through the refugee route of asylum and integration. Building upon this logic, Betts argued that diasporas could also play their role in helping to further transition in their countries of origin. In response, two Oxford University students challenged their professor, claiming that it is ethically wrong to see refugees as ‘political resources’ and that this formulation may undermine individual agency. It is also naïve. As Paul Hockenos records in Homeland Calling, a book which describes how diasporas from the former Yugoslavia behaved during the Balkan conflicts of the 1990s, many diasporas house interfering chauvinists and even when they vote for democrats and appear to have the trappings of settled Americans, Canadians or Europeans, their views towards their countries of birth or sentimental attachment may be considerably less enlightened. Two Oxford University students challenged their professor, claiming that it is ethically wrong to see refugees as ‘political resources’. It is also naïve. This is simply inaccurate. The reasons why many failed states have generated large numbers of refugees are often the result of political inequality which may manifest as societal discrimination and persecution by both state and non-state actors. Syria, Iraq, Afghanistan, Somalia and now South Sudan are emblematic of the contemporary refugee-producing state, where large numbers are expressly fleeing as a result of well-founded fear of persecution. Moreover, we return to the fact that the reasons why large numbers of refugees are concentrated in states which have not ratified the Refugee Convention is not only the failure of past development efforts but also a reflection of their lack of options and the absence of safe and legal routes out of these regions. Rather than think of refugees as potential agents of terror, or as the condition for receiving aid, as tools for economic development or political reform, why not think of them as people in need of protection? We need to stop downgrading refugee protection and accept that for millions of refugees persecution is the principal reason for flight today as it was before, during and after the Holocaust. In so doing, we would be affirming the importance of human rights and the rationale behind the refugee regime which remains more relevant than ever. See Huffington Post, Read Draft Text Of Trump’s Executive Order Limiting Muslim Entry To The U.S. (EXCLUSIVE), 25 January 2017. Alexander Betts & Paul Collier, ‘How to Help Syrians - Let Displaced Syrians Join the Labor Market’, Foreign Affairs, Nov/Dec 2015. Paul Hockenos (2003), Homeland Calling: Exile Patriotism and the Balkan Wars, Cornell University Press.